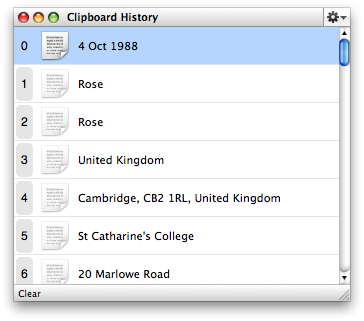 One of the most useful components of Quicksilver is the Clipboard History feature. If you have the Clipboard plugin enabled, you can bring it up with your normal Quicksilver keystroke followed by Cmd-L, and it will show all the recent entries in your clipboard. You can choose how many entries you’d like it to store. There are various things you can do with this: double-clicking or hitting return on one of the items will insert that entry at the current point, for example. I’m filling in some US tax forms for several past years and being able to have things like our fullnames, tax references, and our full home address just a couple of keystrokes away makes the repitition a lot less painful! For a different way of using the Clipboard History facilities, have a look at Nick Santilli’s handy screencast.